College football is more than a sport. It is an experience. The sound of the fight song booming through a packed stadium, the smell of the grill at a tailgate, the way you hug friends and high-five strangers when your team scores – on gameday it seems like everyone is a fan, including Chick-fil-A. But that passion for college football goes beyond the name on a Bowl Game: Chick-fil-A had a large role in partnering to bring the College Football Hall of Fame to its hometown of Atlanta, Georgia. It all started with the Chick-fil-A Peach Bowl. 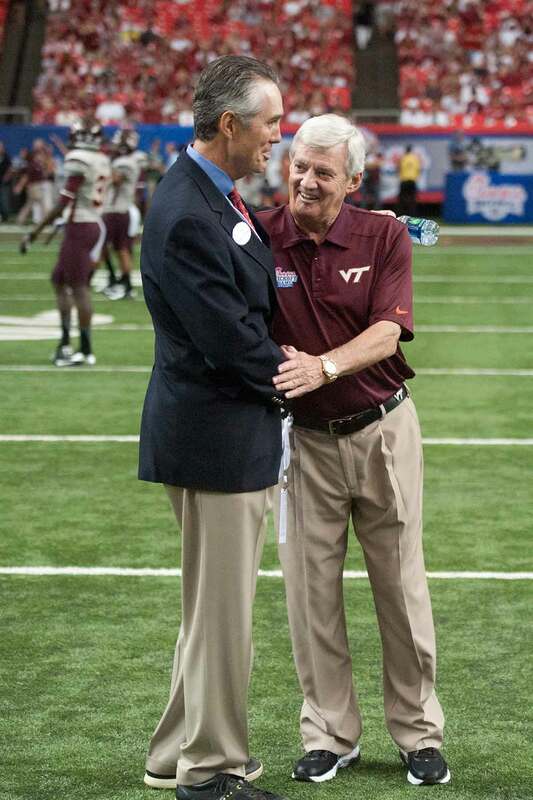 In 2009, The Peach Bowl, Inc. Board of Directors felt there was an opportunity to bring the Hall of Fame to Atlanta, which is the home of both the Bowl and the Chick-fil-A Kickoff Game. Steve Robinson, former Chick-fil-A, Inc. Chief Marketing Officer and member of the Bowl’s board of directors, says that in order to bring the Hall of Fame to Atlanta, Gary Stokan, President and CEO of Peach Bowl, Inc. and the board had to get the Hall’s owner, the National Football Foundation, to support moving it from South Bend, Indiana. The NFF also had to be willing to do a licensing agreement to be able to build and operate the Hall in Georgia’s state capital. That’s where the NFF had a choice to make. They could either take the Hall of Fame to Georgia or bring it to their own home base of Dallas, Texas. The decision was at a critical juncture. John Stephenson was the CFA Peach Bowl Board’s attorney and crafted an agreement that ultimately convinced the NFF to come to Atlanta. Even with all the positives, the NFF needed a financial commitment from Atlanta. The Chick-fil-A Peach Bowl made the first contribution. Then, Chick-fil-A matched it. The National Football Foundation then signed a letter of intent with the Chick-fil-A Peach Bowl, and the College Football Hall of Fame was officially moving to Atlanta. Initial negotiations were over, and it was time for the real planning and execution to begin. Two of the men who helped the project get to this point jumped into expanded roles. Steve Robinson became Chairman of the Board for Atlanta Hall Management, a new non-profit created to build and operate the Hall. The board asked John Stephenson to be the Hall’s President and CEO. Once again, that’s where Chick-fil-A came in. “Dan Cathy and I decided we were in a position with almost 20 years of being in the college football space as a Bowl sponsor, and we wanted to make an offer for a longer-term deal that would help the financial position of the Hall,” Robinson says. That deal was a 30-year commitment that elevated Chick-fil-A’s profile at the attraction. The NFF and Atlanta Hall Management gladly agreed and the Hall took on a new name: The College Football Hall of Fame and Chick-fil-A Fan Experience. Stephenson says that deal helped him secure other sponsors and essentially turned the Hall into the major attraction it is today. 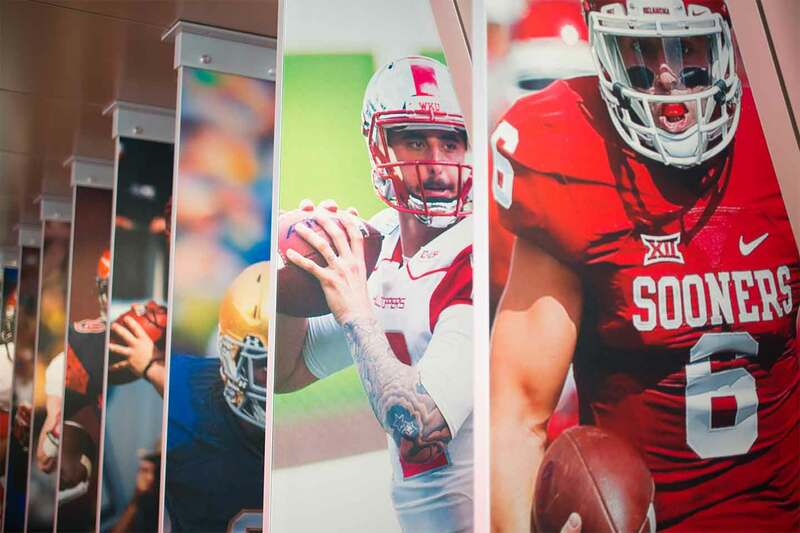 It took 18 months to build the nearly 96,000 square foot Hall of Fame, which includes digital interactive pieces that capture the magic of the entire football experience, as well as artifacts from college football’s fascinating history. “We built it on time and on budget,” Robinson says. In 2017, another big opportunity opened up for Chick-fil-A to double-down on its commitment to the Hall of Fame. The Chick-fil-A Peach Bowl reinvested in the Hall, and Chick-fil-A, with the leadership of Chief Marketing Officer Jon Bridges put an advance on its 30-year commitment, making the company the title sponsor. That salute to fans and teams starts as soon as you walk in the door. 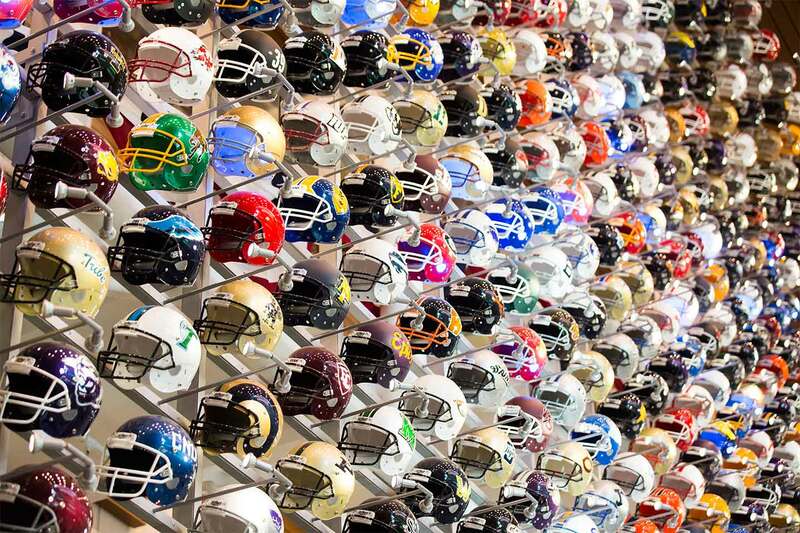 Seven-hundred and seventy-seven football helmets, one representing every team that plays college football, line the wall by the entrance. As soon as a guest signs in and selects their team of choice, their team’s helmet lights up on wall- and stays lit for the entire day. That level of interaction makes the Hall a destination. The Hall of Fame’s historian and curator, Kent Stephens, says that balance of active encounters and history is what makes the attraction, well, attractive for every member of the family. But there’s also a deeper dive in the Hall of Fame section of the attraction. “I think we will be adding more artifacts as we go along, and of course there are some items that are on display permanently.” One of those permanent displays is the Hall’s most prized possession: The Red Grange jersey. There are also a few fascinating artifacts from more recent generations, like the Gary Tyrrell trombone. He was the Stanford band member who was tackled in a no-time-on-the-clock touchdown scored in the 1982 California-Stanford football game. It also happened to be John Elway’s final college game. The play made its way into history, and the trombone became an unlikely trophy, showcased in the shrine to college football. It’s a perfect recipe for bringing people of different interests together: Pieces of history, mixed with the immersive experience of feeling like you’re at a game. Robinson says he’s incredibly proud of the final product and of the process the project’s leaders took to get there. While the city is now home to the Chick-fil-A College Football Hall of Fame, Stephenson says the home of college football is really at each fan’s school.